This quilt has been in the making since May and it was so worth the wait. 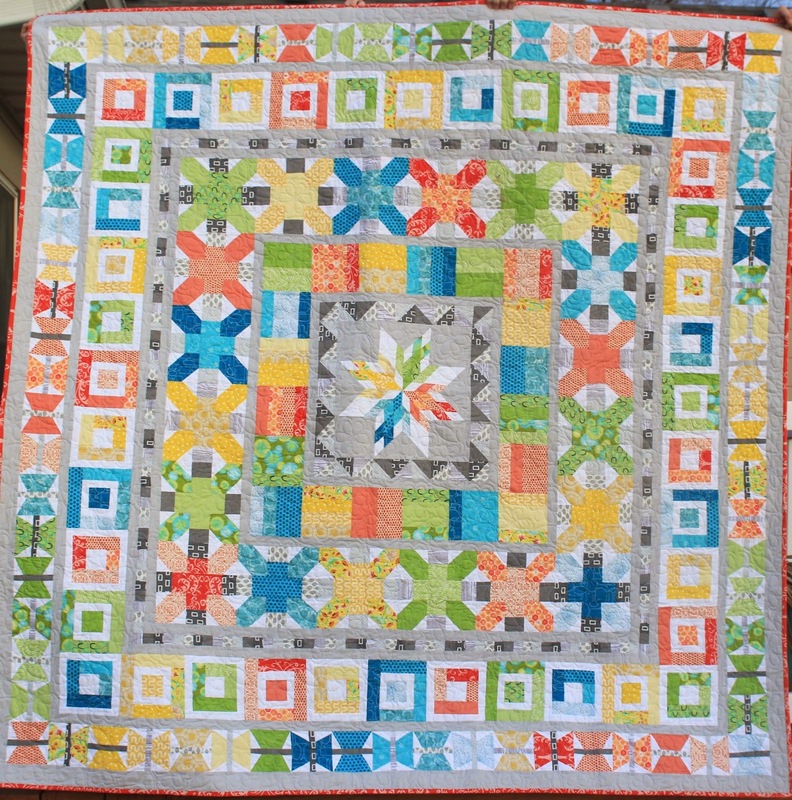 It is a busy quilt but I just love, love it. I didn't use the solids like Oh, Fransson's version on the pdf pattern/ and went with a variety of prints with just a dash of solids The instructions are wonderful for the pattern and easy to follow. 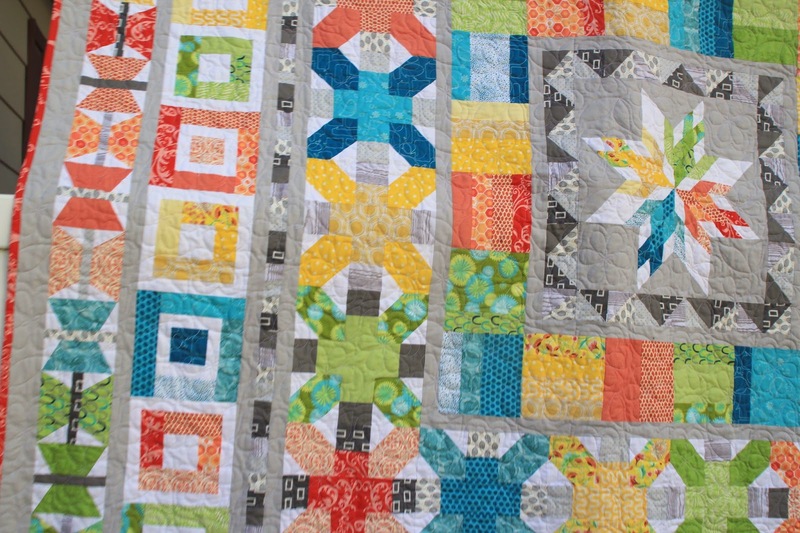 If you want to sew this pattern for yourself, Elizabeth has a great quilt along to help. I do think the middle of this quilt is the most difficult thing I have ever pieced. It looks pretty large on the pattern photo but it really is about smaller size. How small is it you ask? 14" is the size. It took me two trips to my local quilt shop to figure out the fabric. Initially, I was going to recreate the solid one but couldn't get the fabric choices just right. A bit frustrated, I went home and decided to rethink my direction. Bright colors I wanted and with the help of Meredith (quilt shop owner not daughter) we picked these fabrics. I cut a small piece of each fat quarter and taped it onto the master color sheet. If I had not done this, I would have never been able to finish this one. You do reference this color guide all the time. 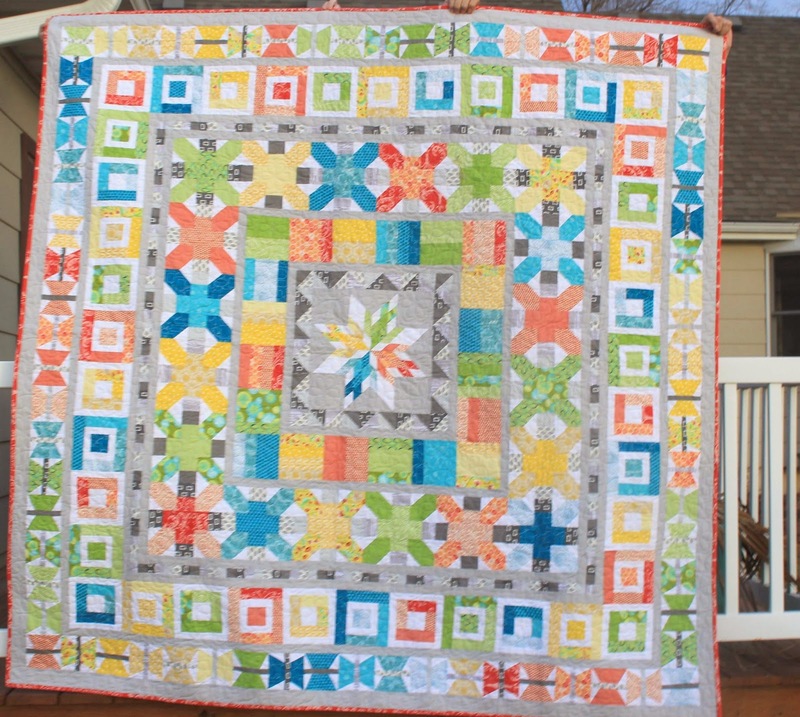 This border the one that resembles an "X" is my favorite, I love how the colors flow. Here is is one more time in all its colorful glory but just at dusk so the colors really softened with fading light. Thanks for the lovely pop of color on this cold & gray Michigan day. Stunning, and worth every minute you put into it! The pop of color is nice her in Missouri, too. Thanks Patty, I love this one. 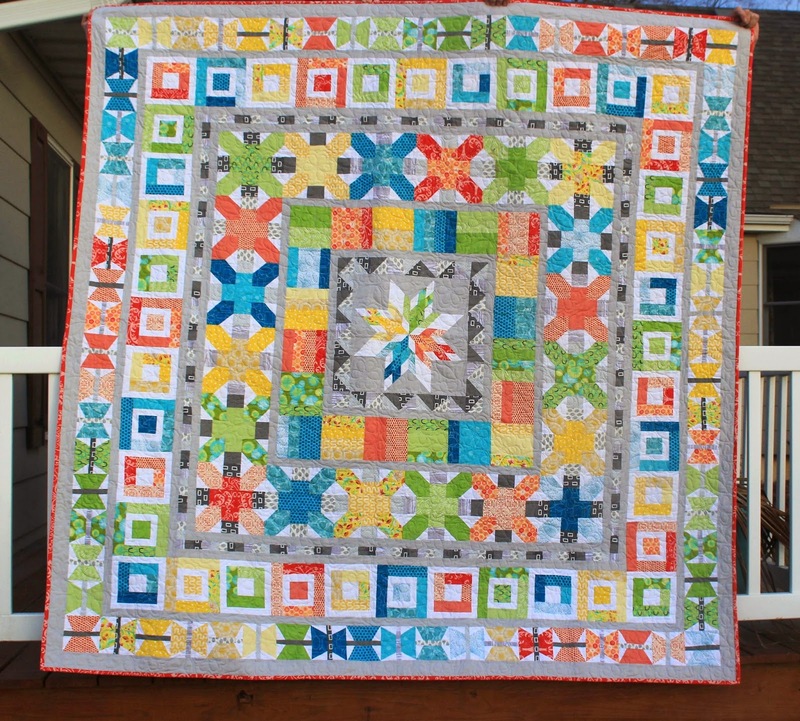 Beautiful quilt Lori! I love the bright colors- really a day brightener. Makes me hopeful for spring! Thanks, Lisa, it is one of my favorites, I love the colors and how all the borders/pieces worked together. Thank you, Mary Ellen, I do love to stay busy and in the winter sewing is one thing to do. 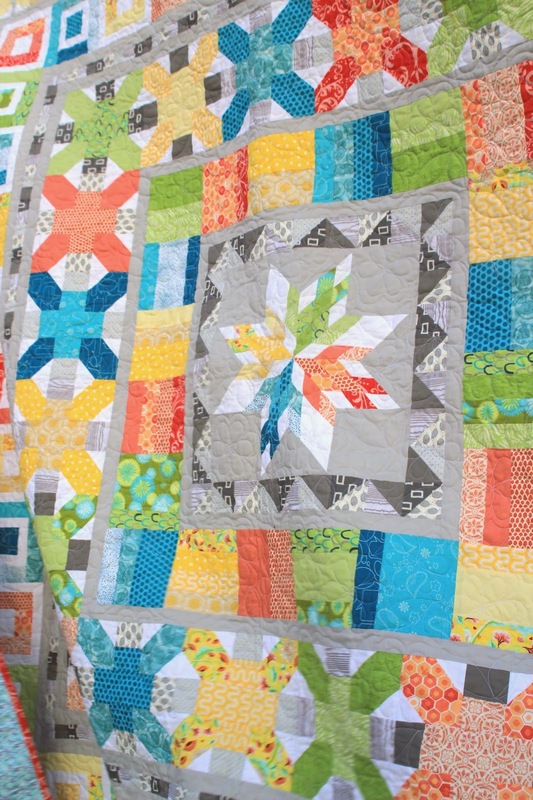 That is a stunning quilt. It looks like it was a lot of work, but definitely with the time you invested in it. Gorgeous! It did take a long time and I did wonder if I would ever finish it. I am so happy I stayed with it, love this one. Thanks so much, Melissa. Just gorgeous! Thanks for sharing it. Thank you, Mary Sarah, it is one of my favorites. That is so beautiful, Lori! I only hope I can be as good as you at quilting one day. Thank you, Meg, and you will surpass my skills, you are an amazing seamstress. You are an inspiration. Love all your posts. Beautiful quilt. The colors just sing. 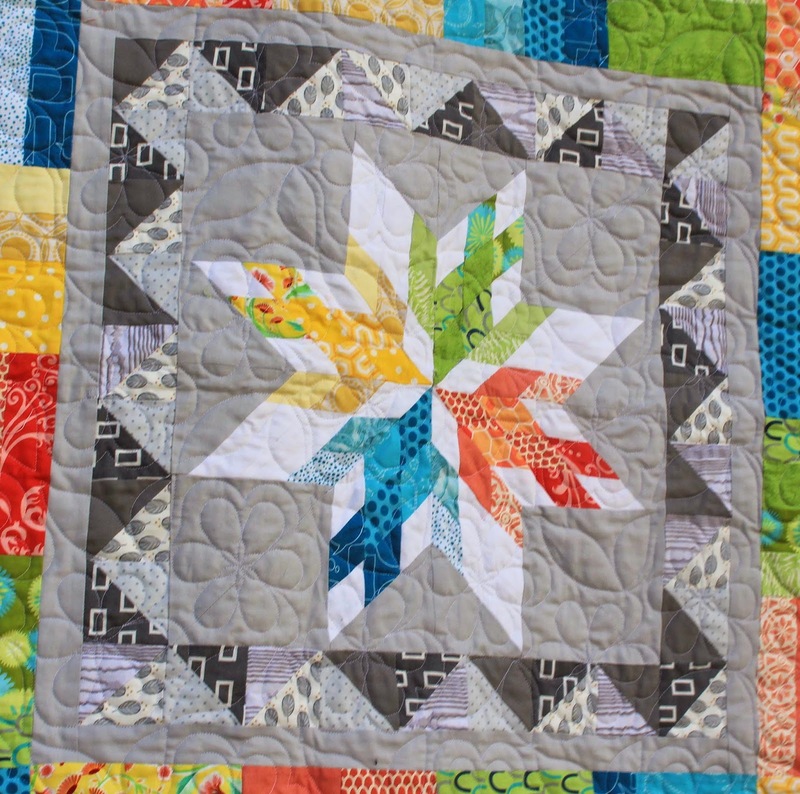 I admire anyone who undertakes a medallion quilt. I am sure getting the different blocks and borders to match wasn't easy! Congratulations on a fantastic finish. Thanks so much. The colors do sing, thanks for that visual. I really stressed about the fabrics and colors on this one, so happy it worked out. What a beautiful quilt! I'm surprised how much I like it. Usually, I don't like busy quilts. I think that the combination of bright colors really make it work. Thanks, Rose, the minute I saw this one, I knew I had to make it. The gray helps to soften the bright colors and make them work - at least I think.